Carrie Underwood looked so posh at the ACM Awards this year! She styled her gunmetal dress with our multi-finger diamond rings . The whole look was stunning! We were so lucky to dress both of these beautiful ladies at the NAACP Image Awards this past weekend! Featured is Tamera Mowry and Lynn Whitfield in our jewelry! If it were us… we’d be giving Hannah B all of the roses! She looked stunning and sophisticated in our diamond rings and earrings last night on the ‘Women Tell All’ special of the Bachelor. Chloe Bennet and Elizabeth Henstridge looked stunning at the Captain Marvel premier. To compliment Chloe’s beautiful floral dress she wore our green jade, diamond and sapphire earrings! Elizabeth on the other hand opted for white diamond floral earrings to match her marvelous red dress! We loved dressing these beautiful women for the Oscars and award parties! Featured: Giuliana Rancic, Cara Santana, Catt Sadler, Erika Christensen, Georgia Fowler, and Stephanie Beatriz. We can’t get enough of Chloe X Halle! Pictured to your left is when we dressed Halle the 2019 Essence Black Women in Hollywood Awards luncheon! We think this look is ultra chic! Mary J. Blige was looking fabulous in orange and diamonds at the premiere of Neflix’s ‘The Umbrella Academy’! We loved seeing her in our white diamond dome ring! All we can say is WOW! The looks were amazing on the red carpet for the 2019 SAG awards! Featured below in our Dena Kemp jewelry (left to right) is actress Britt Baron from Netflix’s Glow, actress Fiona Xie from Crazy Rich Asians, E! News host Giuliana Rancic, and actress Kirby Howell-Baptiste from Killing Eve. How lucky we were to dress such beautiful women for the Critics Choice Awards this past weekend! Featured from left to right, Actress Kiki Layne, Actress Kirby Howell-Baptiste, and Actress Justina Machado. 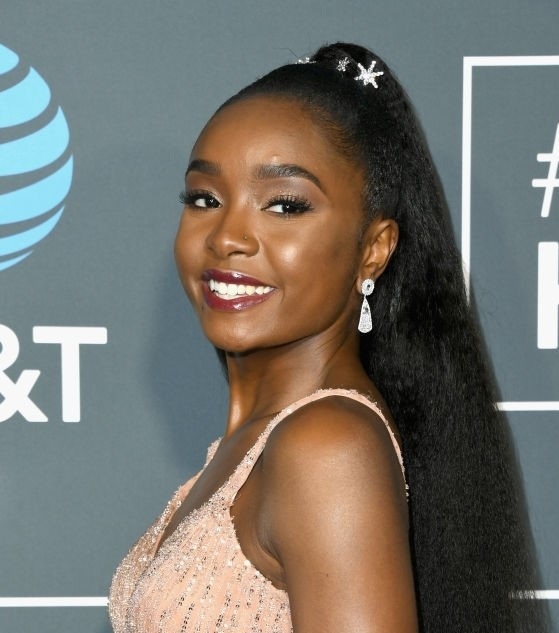 Kiki Layne wore white gold and white diamonds with her peach colored gown while Kirby opted for yellow gold and white diamonds to pop with her pastel blue gown. Justina Machado matched her navy blue dress with rich blue sapphire earrings. Each woman looked lovely! This past weekend marked the 76th Golden Globe Awards! The whole weekend was filled with parties and awards! We were fortunate enough to dress these beautiful women below. Featured to left to right: model Danielle Herrington, actress Emmy Raver-Lampman, and actress Olivia Colman. We loved being apart of this issue of California Wedding Day! This photo shoot was beautiful and looked like so much fun! White gold jewelry perfectly matched the white dresses! Chloe Bennet looked ultra chic in her vintage mustard yellow ensemble paired with some retro Dena Kemp yellow gold jewelry! We are getting some serious 70’s chic vibes here! She wore this look at the 2018 GQ Men of the Year party in Los Angeles! Elisabeth Rohm looked absolutely beautiful at the Mary Poppins premier in Los Angeles wearing our black diamond hoops! Allison Janney looked beautiful in our rustic diamond earrings at the 2018 E! People’s Choice Awards! Congratulations Carrie on winning at the 2018 CMA Awards this year! We loved seeing you in our diamonds! We can’t stop gushing over Oliva Culpo! We were fortunate enough to dress her for a week of awards! She looks fabulous in all of our pieces! We loved dressing these beautiful Angels at the 2018 Victoria’s Secret Fashion Show! Kirsten Vangsness looked stunning presenting at the Engineering Emmy Awards! She paired her beautiful purple floral gown with Dena Kemp diamond chandelier earrings and a diamond ring. Olivia Culpo looked fabulous as always at the 2018 InStyle Awards. She wore an “arm party” of Dena Kemp diamond bangles and bracelets and then multiple diamond rings. She polished the look off with diamond earring climbers. This look is both sophisticated and stylish! Olivia Culpo looked stunning at the JBL Fest. She complimented her edgy cutout jumpsuit with a pair of our all diamond chain link earrings. All we have to say is WOW! We loved having the opportunity to dress so many beautiful women for the 70th annual Emmy’s! Pictured to the left is Lindsay Shookus, producer of Saturday Night Live, who won an Emmy this year! She looked stunning in Dena Kemp drop emerald earrings. (Picture 1) Actress, Jennifer Morrison, is wearing drop black diamond earrings at an after party for the Emmy’s. (Picture 2) E! News reporter, Kristin Dos Santos, was dripping in white diamonds while covering the red carpet. (Picture 3) Actress, Amanda Brugel, was rocking some Dena Kemp black and white earring climbers. (Picture 4) Chef, Sandra Lee, was adorned in white diamond hoops at a pre-emmy party. The beautiful Chloe Bennett looked radiant in purple at the Audi’s Emmy party in Los Angeles! The beautiful Melissa McCarthy looked amazing wearing our white and black diamond egg drop earrings at the 2018 Toronto Film Festival! Olivia Culpo was the "muse" of this month's issue of Lefair Magazine! She was stunning in our diamond choker necklace! Go pick up a copy of the magazine and see for yourself! Stephanie Pratt looked amazing at the 2018 VMA's where they announced that The Hills would be coming back to television! We loved her look that included stacked diamond rings and a diamond palm bracelet! The professional wrestler and mixed martial artist, Ronda Rousey, was a total knock out at the Mile 22 premier! Olivia Cuplo is stunning in our diamond choker! Elisabeth Rohm is wearing one of newer pieces during this photo shoot and all we have to say is.... WOW! 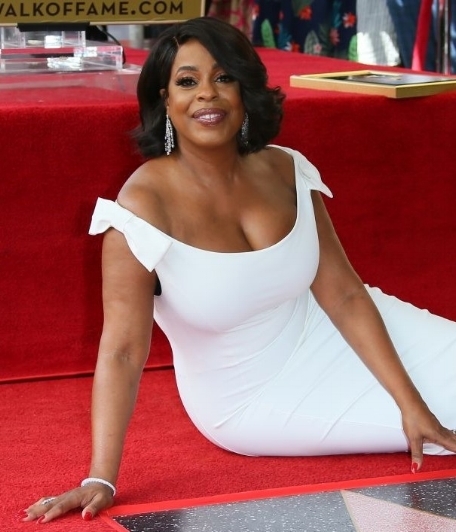 Congratulations Neicy Nash on receiving your star on the Hollywood Walk of Fame! Our jewelry was featured in California Wedding magazine! How beautiful are these brides to be? We loved dressing Becca this season for The Bachelorette! We are so happy for her and Garrett! 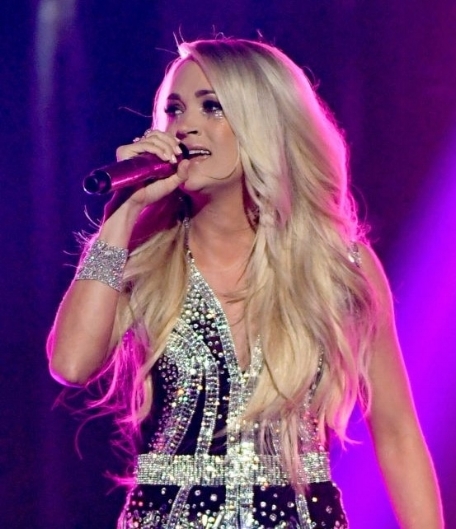 Carrie Underwood had an amazing performance at the AMC Awards this year! She looked stunning in our diamond bracelet cuff that matched her dress perfectly! The gorgeous Tessa Thompson was photographed for a "Wild Frontier" photo-shoot decked out in Dena Kemp jewelry. Her effortlessly chic outfits consisted of delicate pieces topped with western accents. Check out her interview by clicking here. We at Dena Kemp LOVE Paris Jackson so when she wore our jewelry to the Gringo premiere, we fanned out! Look at how beautiful she looks in our white gold hoops! Congratulations Lauren and Arie on a happily ever after! We loved dressing the women on the season finale of The Bachelor! Congratulations Becca on becoming the next Bachelorette! We thought you looked stunning in our jewelry on the season finale of The Bachelor! We look forward to following you on your journey to find true love! The Olympian Lindsey Vonn attended the 2018 Oscars in one of the most beautiful gowns on the red carpet! She looked especially dazzling in our "firework earrings" diamond earrings! Angels are amongst us! We were lucky to be able to dress these beautiful Victoria Secret Angels at the 2018 Oscars. Elsa Hosk wore one of our beautiful diamond bracelets to the event while Lais Ribeiro opted for a gorgeous pair of multi colored sapphire earrings! We were so lucky to be able to dress these beautiful singer songwriters for the Black Panther premiere! Chloe x Halle have been crowned the "Next Big Thing" by Beyonce herself and after listening to their soulful music, we agree! Allison Janney was amazing in her performance in I, Tonya. This awards season, she racked up several nominations and wins! We want to congratulate her on her wins! We were lucky enough to dress her at the Critics Choice Awards!